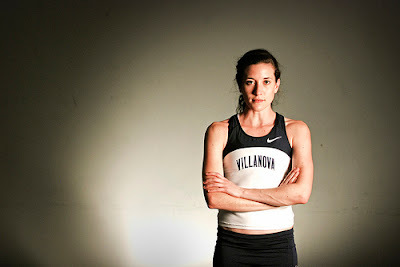 Villanova University’s great track and cross country All-America Sheila Reed has again been named the Philadelphia Sports Writers Association’s Outstanding Amateur Athlete, it was announced by PSWA president Rich Westcott. Reid, the two-time NCAA cross country individual champion, will be honored at the PSWA’s 108th annual Sports Awards Dinner on Monday, January 30, 2012 at the Crowne Plaza Hotel, on Route 70 in Cherry Hill, N.J.
A winner of numerous national awards, Reid was the 2011 outdoor individual champion in the 1500 and the 5000 meters, becoming the first woman ever to double-up in winning both of these events at the same NCAA meet. Indoors, she anchored the Wildcats to a national title in the distance medley relay. An 11-time All America in cross country and indoor and outdoor track, Reid triggered Villanova’s run to its second straight NCAA cross country title in 2010, an achievement that helped the Newmarket, Ontario native win the 2011 Honda Sports Award as the nation’s top female athlete in the sport. Reid was twice named the USTFCCCA National Athlete of the Year and also National Scholar-Athlete of the Year. An English major, she is also a four-time Big East Academic All Star and Villanova’s Senior Student Athlete of the Year. Previous winners of the Outstanding Amateur Athlete award—in addition to Reid last year—include Matt Ryan, Steve Slayton, Jameer Nelson, Lisa Raymond, Dawn Staley, Vicki Huber, Jay Sigel, and Michael Brooks, among others. Other prestigious awards at the dinner that have previously been announced include the Philadelphia Phillies, as the Team of the Year, and Philadelphia Flyers center Claude Giroux, the Pro Athlete of the Year. Phillies manager Charlie Manuel and Flyers coach Peter Laviolette will also be in attendance. The Living Legend, Native Son, Humanitarian of the Year, and Good Guy Athlete awards, among others, will be announced in coming weeks, as will a couple of surprise presentations and some “Special Achievement” awards. The most coveted award—Most Courageous—is kept secret until the night of the dinner. Comedian Joe Conklin will also perform at the oldest continuing sports awards banquet in the nation.